Several recent studies have shown a connection between sleep apnea and diabetes. Diagnosing and treating sleep apnea can help people with diabetes maintain better blood glucose control. Learn more about the relationship between diabetes and sleep apnea and what it means to your overall health. People with obstructive sleep apnea (OSA) experience a partial air blockage when they are asleep. This blockage could be caused by soft tissues in the back of your throat that relax too much, an obstruction caused by your tongue or an issue with your sinuses. People who are overweight or have short necks are more at risk for sleep apnea. As a result, you wake up repeatedly throughout the night as your body struggles for air. Most people are not aware of these episodes because they fall back asleep right away. But it can happen dozens, or even hundreds, of times each night. This can put your body into a fight-or-flight mode. Stress hormones such as cortisol are released and may raise your blood sugar levels. It can also lead to fatigue and napping through out the day. Being chronically tired could mean skipping exercise or snacking throughout the day to try to stay awake. Sleep apnea and behaviors it causes may lead to type 2 diabetes or aggravate the symptoms for those who already have it. People with sleep apnea often snore heavily during sleep and feel tired when they wake up. Throughout the day, they might get headaches, have difficulty concentrating, raise blood sugars, feel irritable, and/or have high blood pressure. Research has shown treating sleep apnea can help improve blood glucose control. If you have these symptoms, discuss them with your doctor. Sleep studies might be recommended to determine if you have this condition. Treatment can help reduce insulin resistance, minimize fatigue, and improve blood sugar levels. Some doctors are now using treatment of sleep apnea to help control diabetes. People who are treated for sleep apnea can get uninterrupted sleep and often start to feel better. Your doctor might order in-home sleep monitoring or recommend a sleep clinic for an accurate diagnosis. A technician at the sleep center will tape sensors onto various parts of your body before you go to sleep. The sensors monitor your brain waves, blood oxygen, breathing rate, heart rate, and flow of air through your breathing passages. They also determine how long you are in restorative sleep, also known as the rapid eye movement (REM) stage of sleep. Breathing problems are often detected during the REM stage. Oxygen levels in the blood might be lowered and the heart rate may increase. After the doctor evaluates these results, a treatment is recommended. This might include weight loss for people who are overweight or obese and/or CPAP (continuous positive airway pressure) therapy. A recent study revealed the majority of obese people with type 2 diabetes also had sleep apnea. Losing just 10 percent of their body weight helped improve the symptoms of sleep apnea, and even resolved them for some of the patients. CPAP therapy is recommended for those with moderate to severe obstructive sleep apnea. 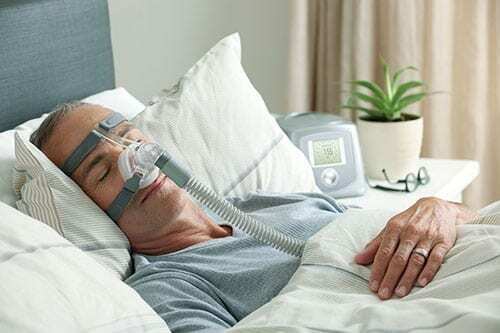 CPAP headgear basically consists of a mask that is worn over the nose and/or mouth during sleep. A machine blows air through the mask. The masks of today are much less intrusive compared to the older masks. Minor adjustments might need to be made, based on your sleep patterns. Successful treatment can help reduce blood sugar levels and lower high blood pressure.